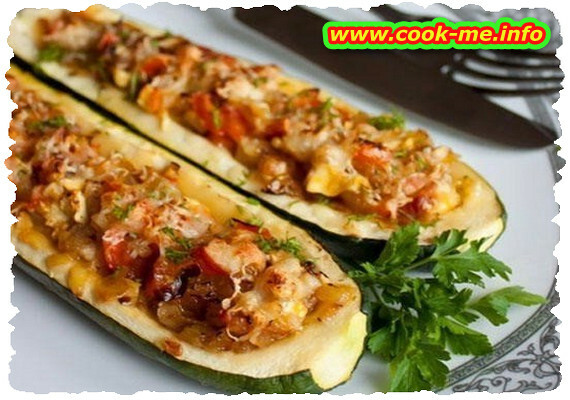 Home Meat Snacks Vegetables Zucchini stuffed with pork. A yummy combination. Chop the onion, fry it in butter, add rice and cook together until the rice turns golden. Let it cool and mix with minced meat, season with salt, pepper, chopped dill and thyme. Clean the zucchini thoroughly and cut each one in halves (cut the width). Scrape out the seeds and keep the edge as thick as it is. Fill the halves with the meat mixture and, as a lid, use tomato pieces. Place them in the pan, horizontally, one next to another. Pour the tomato juice over and 1/4 liter hot water. Cover them, and let it boil over low heat for 30-40 minutes. After 20 minutes, turn the zucchini up. When the zucchini are boiled (careful, they mustn't be too soft), make a sauce out of flour and 2 Tbs of cold water or tomato juice. Pour it and mix it with the gravy in the pan; let it turn to boil a few times. Add 2-3 Tbs oil and season to taste. Serve simple or with sour cream or yogurt.